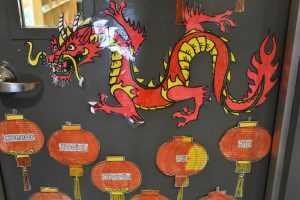 Lunar New Year marks the start of a new year in the traditional Chinese lunisolar calendar, and usually occurs on the second new moon after the winter solstice. The Chinese Zodiac contains twelve animals and each lunisolar year corresponds to a different one. February 2019 marks the beginning of the Year of the Pig – also called the Year of the Boar depending on the country – which symbolizes wealth. Although the holiday is officially one day, February 5, it is surrounded by weeks of festivities including parades and the celebration of traditions. The Orange Cluster continued their study of China for Lunar New Year. 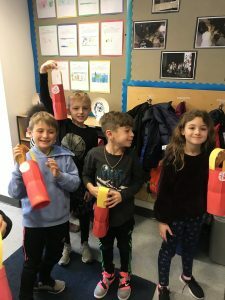 Earlier in the school year, students completed a customs simulation in which they “traveled” to China, even getting a stamp in their “passport.” For the holiday, Orange Cluster classrooms transformed into stations, which students rotated through to complete different activities. In one room they made red envelopes, the color of which symbolizes good luck. Traditionally, red envelopes contain gifts or money which are given to family members to celebrate the new year. In another room, they ate dumplings, and at another station made and decorated Chinese lanterns with a symbol of good fortune. Ms. Dobish also invited a Yellow Cluster student who celebrates the holiday to teach her students about it.